For a while I’ve been meaning to do some more advanced posts on optimization problems of all flavors. One technique that comes up over and over again is Lagrange multipliers, so this post is going to be a leisurely reminder of that technique. I often forget how to do these basic calculus-type things, so it’s good practice. We will assume something about the reader’s knowledge, but it’s a short list: know how to operate with vectors and the dot product, know how to take a partial derivative, and know that in single-variable calculus the local maxima and minima of a differentiable function occur when the derivative vanishes. All of the functions we’ll work with in this post will have infinitely many derivatives (i.e. smooth). So things will be nice. To make things easier for ourselves, we’ll just call a function and understand to be a vector in . We can also think of as a function which takes in vectors and spits out vectors, by plugging in the input vector into each . And the reason we do this is because it lets us describe the derivative of at a point as a linear map based on the gradient. That is, if we want to know how fast is growing along a particular vector and at a particular point , we can just take a dot product of with . I like to call dot products inner products, and use the notation . Here is a vector in which we think of as “tangent vectors” to the surface defined by . And if we scale bigger or smaller, the value of the derivative scales with it (of course, because the derivative is a linear map!). Usually we use unit vectors to represent directions, but there’s no reason we have to. Calculus textbooks often require this to define a “directional derivative,” but perhaps it is better to understand the linear algebra over memorizing these arbitrary choices. For example, let . Then , and . Now if we pick a vector to go along, say, , we get the derivative of along is . As importantly as computing derivatives is finding where the derivative is zero, and the geometry of the gradient can help us here. Specifically, if we think of our function as a surface sitting in (as in the picture below), it’s not hard to see that the gradient vector points in the direction of steepest ascent of . How do we know this? Well if you fix a point and you’re forced to use a vector of the same magnitude as , how can you maximize the inner product ? Well, you just pick to be equal to , of course! This will turn the dot product into the square norm of . where is the angle between the vectors (in ). We might not know how to get that angle, and in this post we don’t care, but we do know that is between -1 and 1. And so if is fixed and we can’t change the norm of but only its direction, we will maximize the dot product when the two vectors point in the same direction, when is zero. All of this is just to say that the gradient at a point can be interpreted as having a specific direction. It’s the direction of steepest ascent of the surface , and it’s size tells you how steep is at that point. The opposite direction is the direction of steepest descent, and the orthogonal directions (when ) have derivative zero. Now what happens if we’re at a local minimum or maximum? Well it’s necessary that is flat, and so by our discussion above the derivatives in all directions must be zero. It’s a basic linear algebra proof to show that this means the gradient is the zero vector. You can prove this by asking what sorts of vectors have a dot product of zero with all other vectors ? Now once we have a local max or a local min, how do we tell which? The answer is actually a bit complicated, and it requires you to inspect the eigenvalues of the Hessian of . We won’t dally on eigenvalues except to explain the idea in brief: for an variable function the Hessian of at is an -by- matrix where the entry is the value of . It just so turns out that if this matrix has only positive eigenvalues, then is a local minimum. If the eigenvalues are all negative, it’s a local max. If some are negative and some are positive, then it’s a saddle point. And if zero is an eigenvalue then we’re screwed and can’t conclude anything without more work. But all of this Hessian business isn’t particularly important for us, because most of our applications of the Lagrangian will work with functions where we already know that there is a unique global maximum or minimum. Finding where the gradient is zero is enough. As much as this author stresses the importance of linear algebra, we simply won’t need to compute any eigenvalues for this one. What we will need to do is look at optimizing functions which are constrained by some equality conditions. This is where Lagrangians come into play. Often times we will want to find a minimum or maximum of a function , but we will have additional constraints. The simplest kind is an equality constraint. Way back in the scientific revolution, Fermat discovered a technique to solve such problems that was later generalized by Lagrange. The idea is to combine these constraints into one function whose gradient provides enough information to find a maximum. Clearly such information needs to include two things: that the gradient of is zero, and that the constraint is satisfied. Now if we require the gradient to be zero, the last equation is simply the original constraint, and the first three equations say that . In other words, we’re saying that the two gradients must point in the same direction for the function to provide a maximum. Solving for where these equations vanish gives some trivial solutions (one variable is and the rest zero, and ), and a solution defined by which is clearly the maximal of the choices. Indeed, this will work in general, and you can see a geometric and analytic proof in these notes. And then a theorem of Lagrange is that all optimal solutions to the problem satisfy for some choice of . But then you have to go solve the system and figure out which of the solutions gives you your optimum. Some important examples of convex functions: exponentials, quadratics whose leading coefficient is positive, square norms of a vector variable, and linear functions. So , and since was arbitrary then is the global minimum. This alleviates our problem of having to sort through multiple solutions, and in particular it helps us to write programs to solve optimization problems: we know that techniques like gradient descent will never converge to a false local minimum. That’s all for now! The next question we might shadowily ask: what happens if we add inequality constraints? 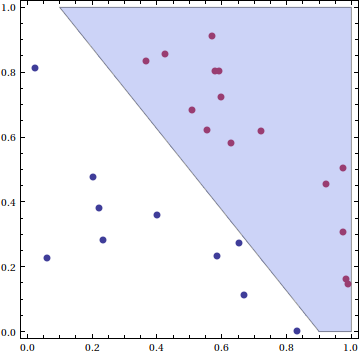 Use a number of Perceptron models in some sort of conjunction. Use the Perceptron model on some non-linear transformation of the data. It is quite useful to literally think of this picture as a directed graph (see this blog’s gentle introduction to graph theory if you don’t know what a graph is). The edges corresponding to the coordinates of the input vector have weights , and the output edge corresponds to the sign of the linear combination. If we further enforce the inputs to be binary (that is, ), then we get a very nice biological interpretation of the system. If we think of the unit as a neuron, then the input edges correspond to nerve impulses, which can either be on or off (identically to an electrical circuit: there is high current or low current). The weights correspond to the strength of the neuronal connection. The neuron transmits or does not transmit a pulse as output depending on whether the inputs are strong enough. We’re not quite done, though, because in this interpretation the output of the neuron will either fire or not fire. However, neurons in real life are somewhat more complicated. Specifically, neurons do not fire signals according to a discontinuous function. In addition, we want to use the usual tools from classical calculus to analyze our neuron, but we cannot do that unless the activation function is differentiable, and a prerequisite for that is to be continuous. In plain words, we need to allow our neurons to be able to “partially fire.” We need a small range at which the neuron ramps up quickly from not firing to firing, so that the activation function as a whole is differentiable. This raises the obvious question: what function should we pick? It turns out that there are a number of possible functions we could use, ranging from polynomial to exponential in nature. But before we pick one in particular, let’s outline the qualities we want such a function to have. It has a first derivative . has horizontal asymptotes at both 0 and 1 (and as a consequence, , and ). and are both computable functions. And it is easy to see visually that this is what we want. As a side note, the sigmoid function is actually not used very often in practice for a good reason: it gets too “flat” when the function value approaches 0 or 1. The reason this is bad is because how “flat” the function is (the gradient) will guide the learning process. If the function is very flat, then the network won’t learn as quickly. This will manifest itself in our test later in this post, when we see that a neural network struggles to learn the sine function. It struggles specifically at those values of the function that are close to 1 or -1. Though I don’t want to go into too much detail about this, one alternative that has found a lot of success in deep learning is the “rectified linear unit.” This also breaks the assumption of having a derivative everywhere, so one needs a bit more work to deal with that. Withholding any discussion of why one would pick one specific activation over another, there is one more small detail. In the Perceptron model we allowed a “bias” which translated the separating hyperplane so that it need not pass through the origin, hence allowing a the set of all pairs to represent every possible hyperplane. Perhaps the simplest way to incorporate the bias into this model is to add another input which is fixed to 1. Then we add a weight , and it is easy to see that the constant can just be replaced with the weight . In other words, the inner product is the same as the inner product of two new vectors where we set and and for all other . We call the bias weight, and by convention the first input coordinate is fixed to 1 for all inputs . The question of how to “train” a single neuron is just a reformulation of the Perceptron problem. If we have a data set with class labels , we want to update the weights of a neuron so that the outputs agree with their class labels; that is, for all . And we saw in the Perceptron how to do this: it’s fast and efficient, given that the data are linearly separable. 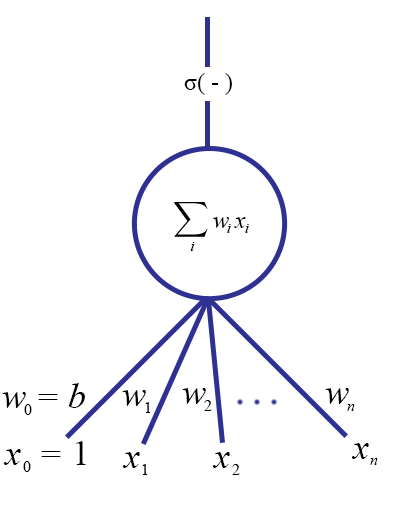 And in fact training a neuron in this model (accounting for the new activation function) will give us identical decision functions as in the Perceptron model. All we have done so far is change our perspective from geometry to biology. But as we mentioned originally, we want to form a mathematical army of neurons, all working together to form a more powerful decision function. The question is what form should this army take? Since we already thought of a single neuron as a graph, let’s generalize this. Instead of having a bunch of “input” vertices, a single “output” vertex, and one neuron doing the computation, we now have the same set of input vertices, the same output vertex, but now a number of intermediate neurons connected arbitrarily to each other. That is, the edges that are outputs of some neurons are connected to the inputs of other neurons, and the very last neuron’s output is the final output. We call such a construction a neural network. To compute the output of any neuron , we need to compute the values of the impulse functions for each neuron whose output feeds into . This in turn requires computing the values of the impulse functions for each of the inputs to those neurons, and so on. If we imagine electric current flowing through such a structure, we can view it as a kind of network flow problem, which is where the name “neural networks” comes from. This structure is also called a dependency graph, and (in the parlance of graph theory) a directed acyclic graph. Though nothing technical about these structures will show up in this particular post, we plan in the future to provide primers on their basic theories. We remark that we view the above picture as a directed graph with the directed edges going upwards. 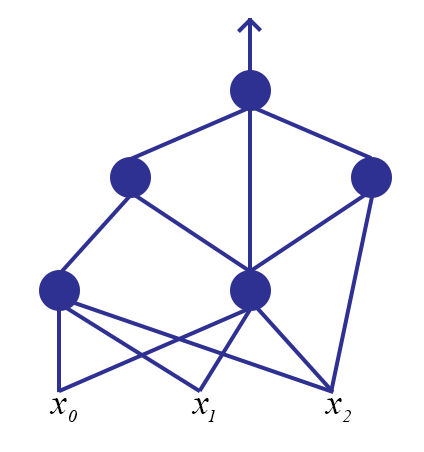 And as in the picture, the incidence structure (which pairs of neurons are connected or not connected) of the graph is totally arbitrary, as long as it has no cycles. Note that this is in contrast to the classical idea of a neural network as “layered” with one or more intermediate layers, such that all neurons in neighboring layers are completely connected to one another. Hence we will take a slightly more general approach in this post. Now the question of training a network of interconnected neurons is significantly more complicated than that of training a single neuron. The algorithm to do so is called backpropagation, because we will check to see if the final output is an error, and if it is we will propagate the error backward through the network, updating weights as we go. But before we get there, let’s explore some motivation for the algorithm. Let us return to the case of a single neuron with weights and an input . And momentarily, let us remove the activation function from the picture (so that just computes the summation part). In this simplified world it is easy to take a given set of training inputs with labels and compute the error of our neuron on the entire training set. A standard mathematical way to compute error is by sum of the squared deviations of our neuron’s output from the actual label. The important part is that is a function just of the weights . In other words, the set of weights completely specifies the behavior of a single neuron. Enter calculus. Any time we have a multivariate function (here, each of the weights is a variable), then we can speak of its minima and maxima. In our case we strive to find a global minimum of the error function , for then we would have learned our target classification function as well as possible. Indeed, to improve upon our current set of weights, we can use the standard gradient-descent algorithm. We have discussed versions of the gradient-descent algorithm on this blog before, as in our posts on decrypting substitution ciphers with n-grams and finding optimal stackings in Texas Hold ‘Em. We didn’t work with calculus there because the spaces involved were all discrete. But here we will eventually extend this error function to allow the inputs to be real-valued instead of binary, and so we need the full power of calculus. Luckily for the uninformed reader, the concept of gradient descent is the same in both cases. Since gives us a real number for each possible neuron (each choice of weights), we can take our current neuron and make it better it by changing the weights slightly, and ensuring our change gives us a smaller value under . If we cannot ensure this, then we have reached a minimum. Then we compute the gradient of . For fixed values of the variables (our current set of weights) this is a vector in , and as we know from calculus it points in the direction of steepest ascent of the function . That is, if we subtract some sufficiently small multiple of this vector from our current weight vector, we will be closer to a minimum of the error function than we were before. If we were to add, we’d go toward a maximum. where is some fixed parameter between 0 and 1 that represent the “learning rate.” We will not mention too much except to say that as long as it is sufficiently small and we allow ourselves enough time to learn, we are guaranteed to get a good approximation of some local minimum (though it might not be a global one). With this update rule it suffices to compute explicitly. For our purposes in this post, the stochastic and non-stochastic update rules will give identical results. Now that we have motivated an update rule for a single neuron, let’s see how to apply this to an entire network of neurons. There is a glaring problem in training a neural network using the update rule above. We don’t know what the “expected” output of any of the internal edges in the graph are. In order to compute the error we need to know what the correct output should be, but we don’t immediately have this information. We don’t know the error value for a non-output node in the network. In the picture above, we know the expected value of the edge leaving the node , but not that of . In order to compute the error for , we need to derive some kind of error value for nodes in the middle of the network. It seems reasonable that the error for should depend on the errors of the nodes for which provides an input. That is, in the following picture the error should come from all of the neurons . where is the error computed for the node . It turns out that there is a nice theoretical justification for using this quantity as well. In particular, if we think of the entire network as a single function, we can imagine the error as being a very convoluted function of all the weights in the network. But no matter how confusing the function may be to write down, we know that it only involves addition, multiplication, and composition of differentiable functions. So if we want to know how to update the error with respect to a weight that is hidden very far down in the network, in theory it just requires enough applications of the chain rule to find it. To see this, let’s say we have a nodes connected forward to nodes connected forward to nodes , such that the weights represent weights going from , and weights are . where represents the value of the impulse function at each of the output neurons, in terms of a bunch of crazy summations we omit for clarity. where by we denote the vector of inputs to the neuron in question (these may be the original input if this neuron is the first in the network and all of the inputs are connected to it, or it may be the outputs of other neurons feeding into it). The argument we gave only really holds for a network where there are only two edges from the input to the output. But the reader who has mastered the art of juggling notation may easily generalize this via induction to prove it in general. This really is a sensible weight update for any neuron in the network. And now that we have established our update rule, the backpropagation algorithm for training a neural network becomes relatively straightforward. Start by initializing the weights in the network at random. Evaluate an input by feeding it forward through the network and recording at each internal node the output value , and call the final output . Then compute the error for that output value, propagate the error back to each of the nodes feeding into the output node, and update the weights for the output node using our update rule. Repeat this error propagation followed by a weight update for each of the nodes feeding into the output node in the same way, compute the updates for the nodes feeding into those nodes, and so on until the weights of the entire network are updated. Then repeat with a new input . One minor issue is when to stop. Specifically, it won’t be the case that we only need to evaluate each input exactly once. Depending on how the learning parameter is set, we may need to evaluate the entire training set many times! Indeed, we should only stop when the gradient for all of our examples is small, or we have run it for long enough to exhaust our patience. For simplicity we will ignore checking for a small gradient, and we will simply fix a number of iterations. We leave the gradient check as an exercise to the reader. Then the result is a trained network, which we can further use to evaluate the labels for unknown inputs. We now turn to implementing a neural network. As usual, all of the source code used in this post (and then some) is available on this blog’s Github page. 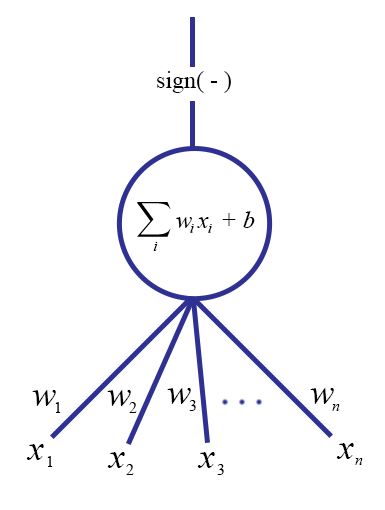 Then a neural network is represented by the set of input and output nodes. A network calls the evaluate function on its output node, and each node recursively calls evaluate on the sources of each of its incoming edges. An InputNode simply returns the corresponding entry in the inputVector (which requires us to pass the input vector along through the recursive calls). Since our graph structure is arbitrary, we note that some nodes may be “evaluated” more than once per evaluation. As such, we need to store the node’s output for the duration of the evaluation. We also need to store this value for use in training, and so before a call to evaluate we must clear this value. We omit the details here for brevity. We will use the evaluate() function for training as well as for evaluating unknown inputs. As usual, examples of using these classes (and tests) are available in the full source code on this blog’s Github page. In addition, we need to automatically add bias nodes and corresponding edges to the non-input nodes. This results in a new subclass of Node which has a default evaluate() value of 1. Because of the way we organized things, the existence of this class changes nothing about the training algorithm. We simply add a function to the Node class (which is overridden in the InputNode class) which adds a bias node and edge to every non-input node. The details are trivial; the reader may see them in the full source code. These are simply the formulas we derived in the previous sections translated into code. The propagated error is computed as a weighted sum in getError(), and the previous input and output values were saved from the call to evaluate(). Our network is simple: we have a single layer of twenty neurons, each of which is connected to a single input neuron and a single output neuron. The learning rate is set to 0.25, the number of iterations is set to a hundred thousand, and the training set is randomly sampled from the domain. An example of a 20-node neural network approximating two periods of a sine function. This picture hints at an important shortcoming of our algorithm. Note how the neural network’s approximation of the sine function does particularly poorly close to 0 and 1. This is not a coincidence, but rather a side effect of our activation function . In particular, because the sigmoid function achieves the values 0 and 1 only in the limit. That is, they never actually achieve 0 and 1, and in order to get close we require prohibitively large weights (which in turn correspond to rather large values to be fed to the activation function). One potential solution is to modify our sine function slightly more, by scaling it and translating it so that its values lie in , say. We leave this as an exercise to the reader. As one might expect, the neural network also does better when we test it on a single period instead of two (since the sine function is less “complicated” on a single period). We also constructed a data set of binary numbers whose labels were 1 if the number was even and 0 if the number was odd. A similar layout to the sine example with three internal nodes again gave good results. The issues arise on larger datasets. One big problem with training a neural network is that it’s near impossible to determine the “correct” structure of the network ahead of time. The success of our sine function example, for instance, depended much more than we anticipated on the number of nodes used. Of course, this also depends on the choice of learning rate and the number of iterations allowed, but the point is the same: the neural network is fraught with arbitrary choices. What’s worse is that it’s just as impossible to tell if your choices are justified. All you have is an empirical number to determine how well your network does on one training set, and inspecting the values of the various weights will tell you nothing in all but the most trivial of examples. There are a number of researchers who have attempted to alleviate this problem in some way. One prominent example is the Cascade Correlation algorithm, which dynamically builds the network structure depending on the data. Other avenues include dynamically updating the learning rate and using a variety of other activation and error functions, based on information theory and game theory (adding penalties for various undesirable properties). Still other methods involve alternative weight updates based on more advanced optimization techniques (such as the conjugate gradient method). Part of the benefit of the backpropagation algorithm is that the choice of error function is irrelevant, as long as it is differentiable. This gives us a lot of flexibility to customize the neural network for our own application domain. These sorts of questions are what have caused neural networks to become such a huge field of research in machine learning. As such, this blog post has only given the reader a small taste of what is out there. This is the bread and butter in a world of fine cuisine: it’s proven to be a solid choice, but it leaves a cornucopia of flavors unrealized and untapped. The future of this machine learning series, however, will deviate from the neural network path. We will instead investigate the other extension of the Perceptron model, the Support Vector Machine. We will also lay down some formal theories of learning, because as of yet we have simply been exploring algorithms without the ability to give guarantees on their performance. In order to do that, we must needs formalize the notion of an algorithm “learning” a task. This is no small feat, and nobody has quite agreed on the best formalization. We will nevertheless explore these frameworks, and see what kinds of theorems we can prove in them.